UPDATE: Here is the link to the full launch story (2/8). Ford fans, better buckle up. It’s three days before the launch of Asia Pacific’s first-ever Ford Performance vehicle: the Ranger Raptor. Sibling to the F-150 Raptor and inspired by Baja-racing, the Ranger Raptor is making its debut in the Kingdom of Thailand on February 7, 2018. Details are currently scarce at the moment, but reports are pointing towards beefed up running gear with a raised suspension (245 millimeters of ground clearance), a more aggressive tire and wheel set-up (285/70 R 17s), Fox Racing Shox, and possibly an entirely new rear suspension. It’s said that the Ranger Raptor will drop its rear leaf spring suspension in favor of a Watts Linkage set-up. Brakes are also expected to adopt a 4-wheel disc brake set-up as well. Earlier reports said that the Ranger Raptor may adopt a de-tuned EcoBoost V6 engine. However, that’s looking more unlikely, at least for the Asia-Pacific market. The leading candidate is an all-new 2.0-liter turbodiesel engine mated to a 10-speed automatic. Co-developed with General Motors, this transmission will have a low-range transfer case. A specially-tweaked Terrain Management System (TMS) is expected to cap the changes. Style-wise, the Ranger Raptor expected to get a unique grille, beefed up wheel arches, a new front bumper to give it a more aggressive approach angle, and of course, various Raptor badging. Inside, the Ranger Raptor will likely gain a push-button engine start/stop as well as a proximity key system and even more Raptor badging. Now here comes the best bit of news: the wait may not be that long. According to various sources within Ford, the Ranger Raptor is said to launch in Manila this April, likely coinciding with the Manila International Auto Show on April 5, 2018. The timing couldn’t have been better, too. Thanks to pick-up trucks’ exemption under the new vehicle excise tax, Ford could potentially price the Ranger Raptor competitively. 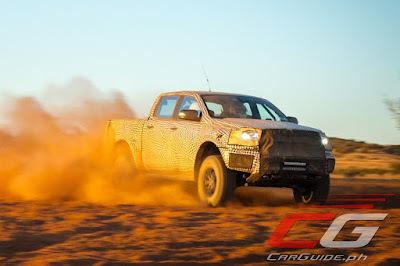 Along with the Manila launch of the Ranger Raptor, Ford is expected to show off the refreshed Ranger line-up as well. We’ll be in Bangkok on February 7 for the Ranger Raptor’s launch so make sure to follow us (@carguideph) on Facebook, Instagram, and Twitter.